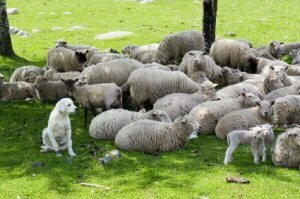 The Akbash dog is a great pet selection - if you have a flock of sheep that need protection or if you're in the market for an intense guard dog. In most cases, though, it's a poor choice for those seeking a pet animal. The Akbash is a primitive dog with a hard-nosed attitude. It's a large and strong breed that's more difficult to successfully train than most. The white Akbash is an impressive sight to behold and developing a relationship with the animal can be an incredibly rewarding experience. However, this is not a good "amateur" dog. Ownership is best left to those who can provide the animal with a "job" and who understand how to properly train and socialize the animal. The Akbash originally hails from what is now western Turkey. The dog was bred over three thousand years ago as a herding animal. It's related to the Akbas and Coban Kopegi herding dogs and shares some of their traits. It isn't an accident that the Akbash is a white dog. Over the centuries, it has been bred that way. 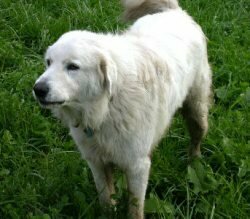 The prevalent theory about that decision argues that white dogs were easier to distinguish from potential predators than were other colors. Today, the Akbash dog breed has found homes outside of the herding world. Although still usually used as a working dog, the Akbash can become a pet for those willing to put in the time and effort necessary for effective training. In most cases, though, you'll find an Akbash serving in a guard dog capacity or in some other related "line of work". The Akbash wasn't bred to be a lap dog or a family pet. It was bred to work hard under difficult conditions. This breeding shows through clearly in its temperament. It's a relatively primitive dog and only owners proficient in training should undertake the responsibility of Akbash ownership. Akbash don't care for the unknown and are not receptive to the presence of strangers. They are not naturally social and don't necessarily do well with children or other dogs. Remember, the Akbash was bred to stand its ground against predators as immense as a bear and it does that job well. Akbash can become very frustrated and will often act out when put in busy settings. They're well-suited for patrolling a herd on a relatively barren landscape and are not naturally at home in traditional pet settings. All in all, the Akbash is a working dog and it does best when maintained in that capacity. This is not to say that the Akbash is always unfriendly or that the breed should be considered dangerous or unfriendly. The Akbash is a good dog, it's personality simply isn't usually suitable for life as a family pet. The Akbash is a large, solid white dog with a large head and very strong jaws. They'll generally grow to a height of around thirty inches and will usually weigh slightly over one hundred pounds. Males tend to be slightly bigger than females, but even small dogs from the Akbash breed can be imposing sights. Their impressive white coat is coarse and it resists matting and can be maintained relatively easily. The Akbash is notable in that it doesn't carry much of a scent on its coat. That may be one reason why it has long been such an effective defender of flocks. The Akbash generally lives around ten years. It is a healthy animal and the breed doesn't seem more susceptible to any particular ailment relative to other breeds. In fact, the Akbash actually appears to resist problems common to other dogs, like hip dysplasia, quite effectively. This hardiness makes perfect sense when you consider that it was bred to function and work within a very difficult environment. The Akbash is not a good first pet. In fact, it's a breed probably best left to those with a great deal of experience training primitive dogs. They are responsive to positive training techniques, but these must be done in a way that will effectively reach this serious breed. Those who live in an apartment setting should not own an Akbash dog. They do best in rural settings and require their own outdoor "territory" and a large fence for containment. The Akbash dog is a working dog, bred to perform very physical tasks. As such, regular and substantial outdoor exercise is a must. Is the Akbash a dog hero?